– the core product module provides simple but powerful print queue management, readily sitting in both the data-centre and the CRD. It can manage variable data business application print jobs from corporate host systems, or support the functions of the reprographics department. – ATI job ticketing enables simple and efficient transfer of users’ print jobs across the network to the CRD with electronic job ticket instructions defining processing and finishing requirements. With ATI’s unified user licensing, network users have total flexibility to submit jobs by “file/print” or web upload from any enabled machine anywhere in the organisation. – as well as its own extensive activity log and reporting capability, ATI software uniquely interfaces with the leading third party cost recovery systems including Equitrac, PaperCut, Pcounter and Safecom. Linked with these systems ATI software gives seamless total print cost and accounting control throughout the organisation wherever jobs may be printed. – is an essential factor for any organisation to consider in these demanding days of cost control and operational efficiency. 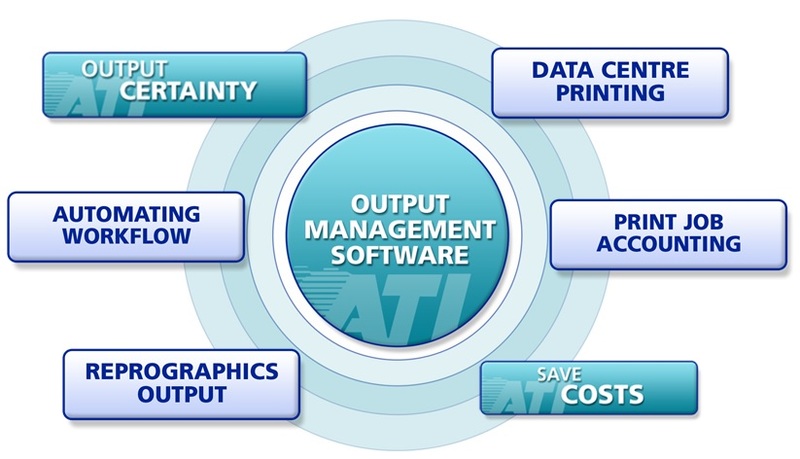 ATI software can provide the control – from simple limiting of colour usage and paper wastage from office email printing – through to control at the point of “file/print” of what is printed in departments or in the print room using the ATI “One Q” solution. – where remote job submission is involved, knowing print job status is important to users. For the print room manager or user on the network, the ATI dashboard web page display can inform both, while automated pop-up and email messaging provide other options. – using the simplicity of Microsoft Word for design, ATI docQforms software provides dynamic document composition for variable host data-stream applications. Without the need for costly and complex host system reprogramming it allows user departments to control output format themselves while IT control the data. – utilising the adaptability of the various modules and the intrinsic power of the native script engine component for customisation, ATI software provides a tool box of software for resolving all sorts of print management requirements for end users and providers of managed print services. Draw on ATI’s wealth of experience and expertise to address your special print output requirements. Some case studies of how ATI has successfully met customer special needs in the office and the print room.